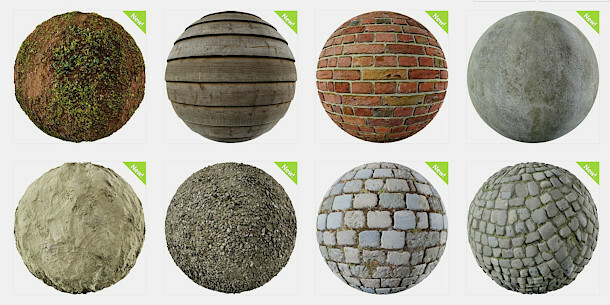 Environment designer Rob Tuytel has launched Texture Haven, a new Patreon-funded online library offering free high-resolution scanned textures under a CC0 licence. At the time of posting, over 50 are available, covering a range of common environment materials. Like the similarly named HDRI Haven – whose founder, Greg Zaal, seems to be backing the project – Texture Haven is a crowdfunded online library dedicated to releasing assets into the public domain. In this case, it’s scanned textures, generated from “between 150 and 250 photos” of the original real-world surface, captured on a Nikon D5300 camera. The raw images are then converted into 3D scans in PhotoScan, and texture maps baked out in Blender. As well as standard diffuse, bump and specular maps, the process generates normal, displacement, ambient occlusion and roughness maps, currently supplied in JPG or PNG format at resolutions of between 1K and 8K. There are currently over 50 available, including bricks, flooring, roofing and ground materials, with Tuytel planning to add more regularly. If you like the assets, you can support the work on Patreon – at the time of posting, the site has hit its funding goal, and is $125/month away from unlocking the next goal of four new textures each month. All of the assets on Texture Haven are available under a Creative Commons CC0 licence, covering use in commercial work. You don’t need to register on the site to download textures.